Humans want to know what’s real, what’s reality, what’s true. We have explored the outside world and our inner worlds for millennia, and we seem to still not be sure what is absolutely real. I think the issue might be that what is really real is not something that can be seen or communicated through language at our dualistic level of perception. We have to transcend duality experientially and consciously in order to know the “really real,” sometimes called the Nondual, the One, the Real, the Absolute, or God. Perhaps only at that level of consciousness may we come to truly know what is ultimately Real and True. Of course, no map is perfect (that includes all theories, philosophies, doctrines, theologies, etc). Far from it! And I’m sure this map has plenty of imperfections and faults too. But this perhaps might help some to begin to grasp the difference between nonduality and duality, where our typical daily experiences are found (duality), and where experiences of God may happen (nonduality). So, for example, we think there is a knower and a known, a subject and object, but these may be two sides of the very same thing, and ultimately inseparable. It’s possible that neither one can exist independently of the other. A subject or knower emerges when there is an object to be known. Consciousness seems to split itself in two, so that there appears to be someone that is knowing something. But this might just be a convention of this level of perception, a kind of practical shortcut, a useful way for consciousness to engage with itself, and manifesting interaction within reality. If we look more closely in contemplation, we may come to realize that the knower, knowing, and known are one and the same. There are many other such dualities that we encounter in our daily life, such as light and dark, hot and cold, male and female, good and evil, health and sickness, day and night, left and right, up and down, life and death. Ordinarily we see these things as opposites, completely opposed to one another, but when we look more closely we may come to realize that they are two poles of a single spectrum of experience, and they may actually be defined by their relationship to their opposite. Here we may also find a unity of opposites. Take light and dark, for example. We know light because of dark, and dark because of light. If we only had one or the other, we would not know it as anything. It would not be contrasted with anything in order to know it as something. The presence of light is the absence of darkness, and the presence of darkness is the absence of light. They are two sides of the very same thing, and we know both because reality manifests as both, along a spectrum of experience. We can’t have just one or the other, or there is no experience of either, there is no reality, no manifestation. 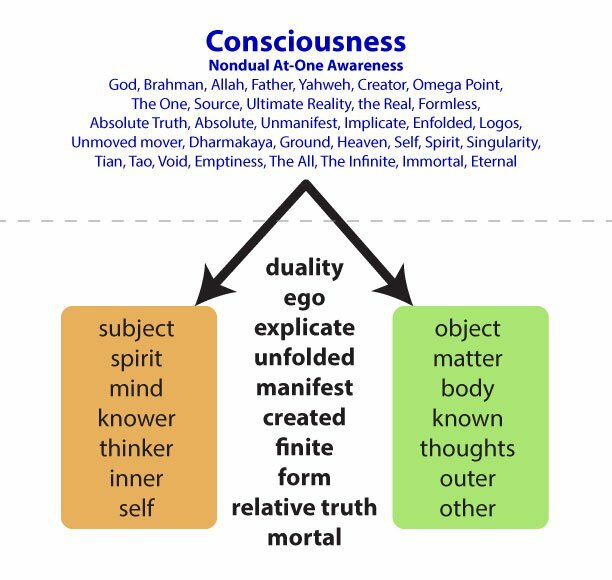 There is even an apparent dualism between the upper half of this map and the lower, between nonduality and duality itself, between Consciousness and manifestation of Consciousness, between God and God’s manifestation in creation. But this may also only be an apparent dualism in our everyday state of mind. God’s manifestation is not separate from God, but is how God manifests its own Self, how ultimate Reality manifests itself. This is perhaps impossible for us to envision. We ordinarily think that one thing creates another thing, and that the creator cannot be in the created, but this seems to only be a condition of our dualistic perspective. When we transcend dualism, we see that the creator is in the created, and is inseparable from the created, and they are two sides of the very same thing. And so we may begin to see through this “veil” of dualities in our everyday consciousness. In meditation and contemplation, these dualities seem to subside, and through regular practice the “veil” may eventually part and we may see through them entirely and experience nonduality (as they say in the East), or at-one-ment/oneness (as they say in the West). When the thoughts of the mind which usually produce the sense of ego-self, or “I,” begin to subside from consciousness, when they cease arising, then the duality that they usually produce in the mind may also subside. Then there is only consciousness, sometimes called pure consciousness, or nondual consciousness. Then we begin to see reality not in terms of dualities, of “self” and “other,” “subject” and “object,” of “this” and “that,” but as One Great Whole. Reality is undivided. And it is not even that “we” are seeing a reality “out there” as One Great Whole, but that we are that One Great Whole. As some say in the East, “You are That” (Tat Tvam Asi), or as Jesus said in the West, “The Father and I are One” (John 10:30). We are undivided from Reality, unseparated from God. We then see Reality as ultimately One inseparable unity, and we are that Seeing (or Seer), that Reality, that One, that Great, that Whole. We see that we are no longer merely a finite, mortal, “self,” a particular form, a body in time, but our true Self transcends all of that into identifying with the One that includes all of that as its phenomenal manifestation. Does this have any correlation with modern science? I think so! Particularly the discoveries of the last century or so, which are finding that ultimate reality may not ultimately be divided into many different points or things in spacetime, but that there may be an underlying unity to all reality that is unexplained, and perhaps unexplainable. Entanglement, or the phenomenon of “two” particles seemingly interacting with each other as if they were one, no matter the apparent distance between them, is just one example of this strange phenomenon which no one has been able to explain. So is the apparent phenomenon that a “particle” doesn’t seem to “become” a particle until it is observed or measured. The interaction between a subject and the object seems to bring the particle into “existence” or creation, collapsing the infinite unmanifest wave function into a discrete definite (finite) manifested particle. All these mind-boggling, transrational, translogical discoveries may be pointing towards that same unified or wholeness of ultimate Reality. And we may never be able to fully explain this ultimate level of reality, the Absolute, the Real, the True, Consciousness, God, for the very reason that anything and everything manifested, created, written, communicated, thought, formulated, theorized, must remain at the dualistic level of reality. These are all inherently dualistic manifestations of that ultimate Reality, and therefore none of them can ever fully explain or represent that ultimate Reality. We can never escape this duality from within duality. The symbol will never be the thing; the map will never be the territory. Any explanation of Reality will never fully be Reality, as it is in itself. We may get closer and closer to explaining it asymptotically, clarifying our dualistic perceptions more and more precisely, and all of this will have enormous utility in the progress of our civilization, as better maps help us better navigate reality. This very post is an attempt at a clarification of Reality, a better map. And yet ultimate Reality, or God, may only be truly and fully and absolutely known through primary nondual experience, through direct first-hand consciousness of it, of Consciousness itself knowing itself, of God knowing God, of Reality knowing Reality, of Cosmos knowing Cosmos, whatever words we want to use. It will be the Self self-reflecting and self-contemplating that ultimately reveals its Self in its true nature. Therefore I think it may forever remain a Mystery at our dualistic level of perception and mind, unexplainable, unknowable, but yet paradoxically at the same time entirely knowable and known at the nondual level of perception and consciousness. This is why I think meditation, contemplation, and other means of shifting consciousness into a nondual or at-one state of perception, may become more and more valued and important, as we come to realize that Reality may only be fully known in that state of perception, and not otherwise. And when more people can perceive Reality in and from that state, then I think we will become far more compassionate, loving, charitable, unified, creative, and at peace with ourselves on our planet, with our ecosystem, and with the Cosmos at large, knowing deeply that we are not ultimately separate from each other or anything else, but are manifestations of the very same One Reality. As Carl Sagan once said, “we are a way for the cosmos to know itself.” And, I would add, the Cosmos does know its Self, as many mystics have attested throughout history, and even as we “know” our Self every day, without knowing it. What do you think of this map? Is it helpful to you? Where do you think it is wrong (because it is wrong)? How would you structure it better? I’d love to know your thoughts and ideas in the comments below or on Facebook.